Player-Owned Farms is here. Yay. I remember the hype for Player-Owned Houses. It was an anticipated update since Runescape Classic, where a fenced off plot of land taunted us with the potential for years until they were finally removed, which made us think it was impossible. Then suddenly, out of nowhere, boom. Construction skill, player-owned houses that you could customize. It was a mind-blow, and more or less the reason I hold construction as one of my more favorite skills. Now, I'm a casual gamer. I don't care about having the best armor or weapons in-game. I don't care about being filthy rich or having all the rares. I don't care about getting 400mil exp on every stat (you just have to believe). I just care about the game's story. The quest series. The lore. I care about trying the new things the game has to offer. I care about having fun and funny and funniness. And I care about dragons. I like dragons. I want them in my farm making more dragons. How do I get dragons? Do I follow a skill tree? Do I start with rabbits and somehow cross breed them to the point they spawn dragons? Do I need to do a quest or have a certain skill? I gotta buy them for a bazillion coins- NOPE! No thanks. Not caring about in-game wealth usually involves me being super poor. Trading is out of the question. So how do I really get them? Granny tells me I get them by fighting dragons. They are a rare drop. ... [Insert your favorite expletive here]! OK, it could have been worse. It could have been one drop every 1000 Queen Black Dragon kills with a fly swatter. 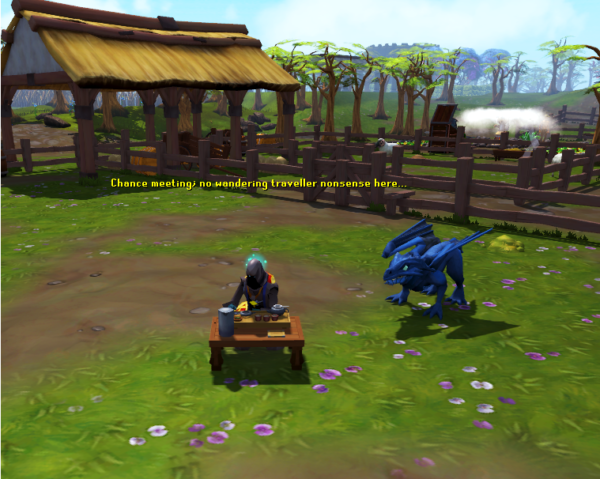 But no, I fight dragons and get a dragon egg after about four hard clue scroll drops. Not that bad. But having to rely entirely on a rare drop just so I can have something that I want is just the worst. Seriously. First, it's not fun. Once again, I'm a casual gamer. I don't devote days and weeks at a time into a game. I just play whenever the time is available, and do whatever appeals to me in that moment. Sometimes I learn how to raid, and sometimes I take a fellow clan-mate up on a group activity. Do it for the experience, you know. So, when I have to go for a rare drop, I'm doing something monotonous. Something I don't find as appealing as most other things I'm doing. And I have to keep on doing it over and over just to get the thing I want. More than likely, it's something that allows me to do something fun. Like grinding for Magister keys just so you can fight the boss. Second, there is little to no skill involved. It is entirely luck based. Meaning that once you do get the rare drop,there is no true feeling of accomplishment. You have not bettered yourself in any way. All you have done is waste time, and perhaps by some miracle, you have wasted slightly less time than somebody else doing the same thing. Whoop-dee-do. Third, it's stressful. As each rare-less drop happens and supplies run low, hope begins to diminish as well. Frustration occurs and impatience sets in. One wonders if the universe has forsaken them or they are caught up in some kind of karmic retribution. Not a pleasant experience. Fourth, once you finally do get it after a long haul, there is no real joy. There is merely the relief that you don't have to do it anymore. But this doesn't even apply here to getting dragon eggs. Oh yeah, did I mention that it's not about just getting one? You have to get at least two. And I say "at least", because if they're not opposite genders, you have to get another one. And dragons can take days to breed, so in order to maximize the potential profit, you need to collect even more. Fifth and finally, I'm not being forced into it. I actually have to will myself to do this. I want dragon eggs because I think dragons are cool and I should have more. I'm the one subjecting myself to the torment of having to fight blue dragons over and over until my minuscule amount of good lifetime karma finally throws me a bone. And I cannot blame the game for anything because it's simply a mechanic, and there is the option of saving up and taking the effort to purchase a dragon egg from a player who is more ambitious than me. Which, at this point, really isn't worth it. Luck is not my most favorite way to achieve something in a game. However, not everything can be solved with skill. Otherwise newer, greener players wouldn't nearly get as much leeway as those who put in whole years to perfecting the art. Sometimes, with a little bit of luck, a newer, less experienced player can also reap benefits to make any master of the game jealous. Jealous enough to keep trying themselves. It's all a part of the experience. 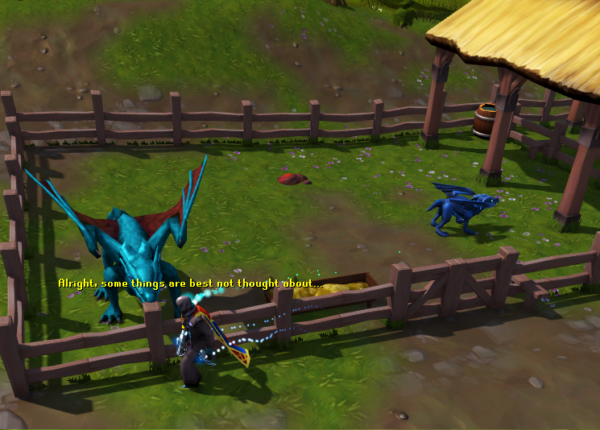 One of the many diversities that make Runescape fun to play as a whole. One just needs to balance out the good and the bad. And I got my dragons. It didn't take too long, and I made a lot of profit from the dragonhides after using porters. I'm content.